I have done many articles in showing that Project Apollo was a massive scam on the world. I figure it is time to repeat some of the proofs that the whole project was an elaborate hoax. We were led to believe that between 1968-1972, 9 flimsy aluminum skinned spacecraft carrying 3 astronauts each went safely to the moon and back to Earth, and in 6 of the missions actually landed men on the lunar surface. This is the official NASA story line. We have been led to believe that these thin aluminum skinned spacecraft went all that way, surviving constant bombardment by cosmic and solar radiation, and micrometeorites. We also have been led to believe that each Apollo mission sustained absolutely no adverse affects by the radiation, or sustained absolutely no hits by these same micrometeorites. These "facts" are indeed remarkable, taking into account that the space between the earth and the moon is a vacuum, with no atmosphere to prevent either space rocks or radiation from hitting the Apollo spacecraft! Micrometeorites travel at many thousands of miles per hour, and with no atmosphere or strong shielded hull of a spacecraft to stop them, one hit by only a pebble sized rock would have easily destroyed any Apollo spacecraft! We have also been led to believe that these craft travelled through thousands of miles of the Van Allen Radiation Belts. These belts encircle the earth starting at about 500 miles up, and the radiation levels alone during a transit of these belts would be enough to either fry the astronauts, give them radiation poisoning, or cancer! People must understand that these Apollo spacecraft were built as flimsily as possible just to make the weight restrictions in getting them off the ground, and had almost no shielding from space radiation! Aluminum barely stops any radiation at all, and considering how paper thin walls of each Apollo spacecraft were, I am truly amazed that any of these astronauts "volunteered" for these missions knowing it could be suicide! We were led to believe that the Apollo spacecraft made this journey with enough internal battery power to prevent the interior of the craft from heating up to 250 degrees fahrenheit during each mission for 5-7 days! THIS fact is something that NASA does not want the public to have full knowledge of... The problem with outer space is not COLD but HEAT.... With absolutely no earth shadow to block solar radiation from hitting the spacecraft during the journey, the interior of the spacecraft will have nowhere to dissipate the buildup of heat within the craft, except by the use of air conditioning. Without air conditioning, the interior will within a short time heat up to about 250 degrees fahrenheit! NASA has had the public believing that each craft would survive for 7 days using batteries only to power enough air conditioning to keep the interior of the craft, including the LEM on the lunar surface cooled! Take the time to look at the video "Moonfaker Exhibit C" to see Ralph Rene's article on Heat in outer space, and the proof from what happened to Skylab in earth orbit, where that craft sustained massive interior overheating due to failure of its sun shading! I am also truly amazed that people still believe that there are no stars visible in outer space, especially on the moon. The pilot of Spaceship One, the first private flight to outer space back in 2004, reported that he saw the sky totally loaded with stars! Read the report for yourselves if you need proof. All of the Apollo astronauts never talk about the stars. The reason is obvious... If they ever had attempted to reproduce stars in the studio where the fakery was done, some amateur astronomers would have easily discovered, and blown the whistle on the entire sham. The astronauts were told to never talk about the stars as a result, and to lie to the public and say that stars could not be seen on the moon, due to either solar glare, earth glare, or moon glare. It is also remarkable about how the Space Shuttle astronauts, and those astronauts on the International Space Station are also told to never discuss stars in any of their observations. NASA has to perpetuate the lie, or the whole sham would be exposed. Other factors come into play that are worth mentioning.... The LEM was too small for the two supposed astronauts to move around in, or even to get out of! Look at Jim Collier's expose on the LEM in his video "Was It Only A Paper Moon?" for more information. The landing of the LEM on the moon was faked due to the simple facts that the retrorocket left absolutely no crater, and the rocket itself powered by hydrazine hypergolic fuel didnt eject a red opaque flame, or smoke during either its landing, or liftoff from the moon! There is also no dispersion of lunar soil under the LEM from its landing on the surface! With almost 2500lbs of thrust in lunar gravity, it should have blown all the soil and rocks away from right below the lander.....NASA definitely blew it here.... How could Neil Armstrong have left that initial footprint on the lunar surface if in reality the lander had blown all that soil away? There is also the so called Lunar Rover, which in alot of photos from the moon shows absolutely no tracks to and from where it is in each picture... The question being.... How did the rover get to its position in each photo without wheel tracks? It appears that they lowered the rover by crane for these photo shoots! Look at Jack White's photo expose closely in aulis.com for more information. Then there is the evidence of shadow divergence in almost all Apollo photographs. On the moon, due to weight restrictions, the astronauts didnt bring any additional lighting with them. Therefore, the only lighting on the moon was the light from the sun, and reflected lighting from the lunar surface, and earth shine. With the sun as the primary and most significant light source, all shadows should have stayed almost parallel. However, we find shadows angling off in different directions, or diverging. This can only be due to a SECONDARY lighting source, and therefore blows the whistle on the whole sham. Apollo-gists stick to the idea that the secondary light is from reflected light off of the moon, or earth shine, but most photo experts dismiss this as not possible. We are there left with the useage of artificial studio lighting as the only explanation! There is so much information to cover about this elaborate scam. Needless to say, billions of people were fooled by this massive hoax, and criminals got rich off of it. People need to understand that they have been lied to about Project Apollo, and that is not easy. It is human nature to want to strongly have faith, and to believe. When they are given evidence of their beliefs to be lies, they become angry, and fight hard to rationalize the lies as being true. We only need to look at how our history has been nothing but a pack of lies to see how Apollo is only one more in the mix. Project Apollo is only one of the many lies of history. Some lies are so hard to believe that criminals have passed laws to prevent proper research from exposing the truth. Apollo is still one that can be researched, and I do strongly urge all of my readers to do so. Do not dismiss real facts by shooting the messengers, for there are a lot of fools out there doing just that, and they fall into the category of fighting hard to rationalize the lies as being true. Remember to be a truth seeker yourselves! Today marks the 5th anniversary of one of the most cowardly, and dastardly murders in history, the murder of Rachel Corrie. This young lady with alot of courage was bravely trying to help some Palestinians in Gaza prevent their home from being bulldozed by the IDF. She stood bravely in front of a large bulldozer in full view of the driver, wearing a bright orange vest for identification. The driver, an Israeli, had obvious disregard for her life, and blatantly ran her over to the horror of all onlookers. Then the driver had the gall to back the bulldozer up and therefore run her over again! She died sometimes later due to the trauma of the massive injuries sustained by this blatant insiduous incident. The Israelis, and their puppets in the US, have worked overtime since that date to keep this murder out of the news.... They have ordered their faithful media to never speak or talk about this incident, and if any news leaks out, to claim that Rachel was a mixed up, and delusional person who had no regard for safety. This is such a load of hogwash, and lies. Someday, maybe soon, these murderous thugs that are presently trying to genocide the Palestinians, will see their justice served. I hope the world will give them the same mercy they showed to this brave soul. Rest In Peace, Rachel Corrie.... Real people who can see the truth will never let your spirit die. We have an ongoing crisis in the Gaza Strip, which is rightfully Palestinian territory, but is under the harsh grip of the Israeli military. The people there are on the verge of starvation, or about to be murdered wholesale by the Israeli army, and all you read about is the ongoing courageous Israeli soldiers, and the poor Jewish people under fire from fake "Iranian built rockets supposedly launched from Gaza"! This is hogwash, and a massive lie! The truth is suppressed from the viewing public. Where is the truth, and where is the real news? These outright lies go hand in hand with the media love of news of idiotic Hollywood celebrities, and their lives. A massive genocide is about to take place in the world, with the outright murder of thousands of innocent people, and much of the world is too dumbed down by BS news to notice? All it seems that people are indoctrinated with are the escapades of either Brittany, or J-Lo, or Lindsay! These type of news events, as I have stated before, are "fluff" and are used to keep people's minds clouded, and kept in the dark to the real reality of the world around them. This way, these controllers can continue their evil actions, and their quest for enslavement of us all, without much interference from the general public! It has been stated in their Protocols of the Elders of Zion about the need to take control all media, and use it as a method of mind control. I have news for people... We are already there! 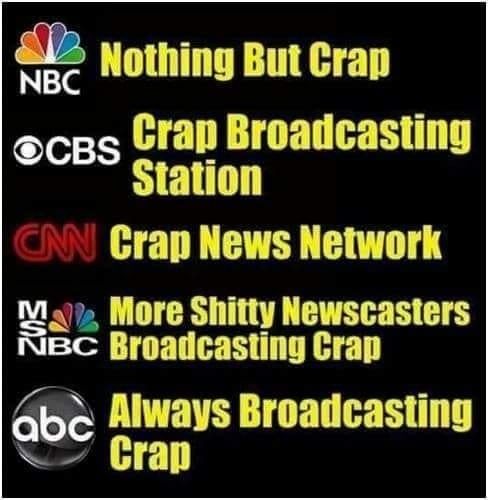 As I have stated before, the idiot box puts out programs with their bias, and their slanted messages on purpose to sway the viewers to their views, and their ideals. As a result, we have not had any decent programming, or even the truth about the world world around us, via the idiot box for years. It also amazes me that the newscasters are all one-sided, and biased in their opinions. I used to believe that most were fearful of losing their jobs if they ever spoke out. But I also have take n a good hard look at who these major network newscasters actually are, and have realized that the majority are either pro-Israeli, Jewish, or hard-core Zionists! Take for example... Wolf Blitzer, and Paula Zahn on CNN.... Both Jewish, Pro-Israel first, and Wolf Blitzer himself is a known hard-core Zionist! When I go down the list of other network Newscasters, I find the majority are also in these catagories. Does anyone notice how all national news is so biased, and pro-Israeli? Watching them has made me sick of the news, and even made me wonder... Where is the pro-US first news? And why are they not for America first? And where is the public outcry about this despicable type of news reporting? Even here in Canada, the slant on Israel first in all the news is so blatant, it is sickening... You cannot open any newspaper, or turn on the idiot box, and look into World affairs without seeing news about Israel this, and Israel that, put in large print blazened on the top of the page, or headlining any idiot box news! But this goes hand in hand with who controls the media in this country also.... CTV is owned by Jewish Pro Israeli interests in Toronto, CBC has always been in bed with the B'nai B'rith and JDL in Ottawa, and Global News is owned by the ultra zionist Asper family! Nowhere on the idiot box will you ever find a news report that condemns the actions of the state of Israel! Even the news of the impending Gaza genocide is never properly covered, with reports from both sides in this conflict! It seems that our last hope for people to have a fair and just news reporting system is the Internet. We must always stay vigil to prevent these monsters from shutting down, or taking control of this important medium. It is the last free and unbiased method of getting truth out. I still strongly urge that you, the reader, take the time to research for yourselves about the truth behind the world we live in. Read online about the true state of Israel, the truth behind the Federal Reserve, the truth behind 9-11, the truth behind Project Apollo, the lies of the 20th century, etc, and turn away from the bias of the idiot box. Remember that they do not call them programs for nothing, and by refusing their programming, eyes can open up to reality and truth! Have the courage to take a stand against the evils around us, and pass the message around. We can still win this fight!